Two spring trainings have been scheduled for University of Oregon faculty and staff members to learn about how to support UO Dreamers. 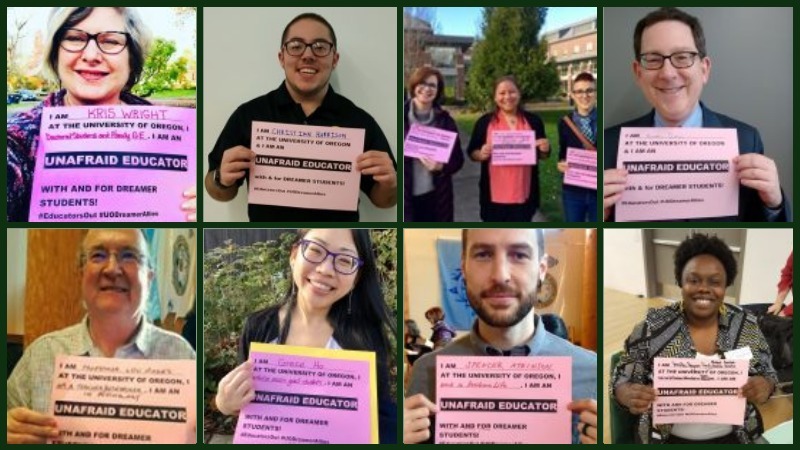 The UO uses the term “Dreamers” to refer to students who are undocumented, participate in the Deferred Action for Childhood Arrivals, receive tuition equity or are from families with mixed immigration status. DACA is an immigration policy that allows two-year stays for some eligible immigrants. The four-hour training will be a mixture of informational presentations and interactive exercises and discussions. Participants will gain an understanding of the challenges facing UO students whose immigration status is precarious or unresolved or who have family members in that situation. After being provided with guidance about effective ways to support Dreamers — including understanding legal and policy issues, learning about available resources and knowing what to do if immigration officers come to campus — participants will be asked to identify one or more positive changes that they and their unit can create to support Dreamers on campus. At the completion of the training, participants can sign a pledge of confidentiality and support and will receive a sign and pin that designates them as a “Dreamer Ally.” The concept is based on the LGBT safe space stickers campaign created for educators who are allies to LGBT students. When students see the sticker, they know they can go to that educator for support. Since 2013, Oregon has allowed undocumented immigrant students with established Oregon roots to pay in-state tuition at public colleges and universities. The number of those students at the UO is growing, as are the challenges they face in the current political climate. The university is committed to promoting the safety, well-being and success of Dreamers while maintaining their confidentiality and identity. Audrey Lucero, a steering group member of the Dreamers work group and an associate professor in the College of Education, noted the importance of the trainings. Spring trainings are 1 to 5 p.m. Friday, April 26, and 9 a.m. to 1 p.m. Friday, May 24. Preregistration is required. To register, scroll to the bottom of the UO Dreamers website and click the button for the session you are interested in. For more information, email uodreamers@uoregon.edu.